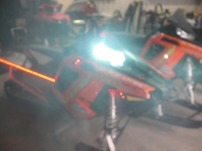 These pictures are of the new AC (alternating current) lighting system on the 2012 Polaris and Arctic Cat snowmobiles. Also, this is working without any external battery- no electric start. It is the work of 4 years of research, and some changes to the internal board on the ballast due to the AC configuration. 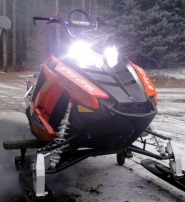 These are being tested now and will be availabie later this winter. This kit is a 6000K Gen V digital ballast with no extra wires, or reconnections to the charging system. Only connections are to the headlight connectors. 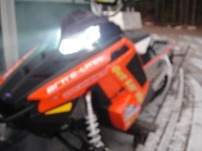 Also on the sled are Fire N Ice intake vents and a remote control LED strip kit.